Wen Bing Tiao Bian (Discrimination of Febrile Diseases, 1798). 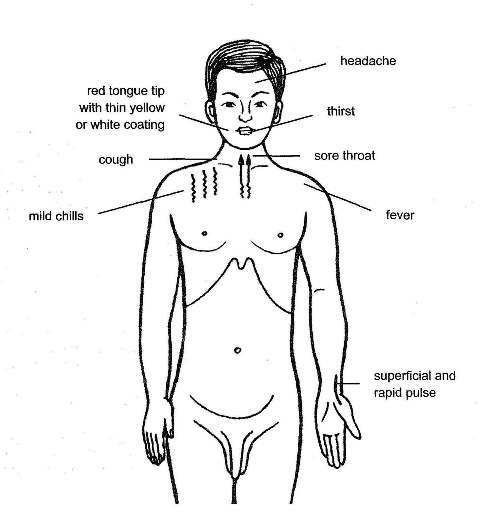 Traditional: Early stage of febrile diseases marked by fever, mild chills, little or no perspiration, cough, sore throat, headache, thirst, red tongue tip with a thin white or thin yellow tongue coating, and a superficial rapid pulse. Modern: Common cold, influenza, acute tonsillitis, pharyngitis, parotitis, and initial stages of pneumonia, encephalitis B, epidemic cerebrospinal meningitis, measles, and mumps.